Road trips can be great for dining. They can also be lousy if you guess wrong about a restaurant. (For example, I went to a dynamite-looking Bavarian pastry shop in Michigan back in ’94 that looked so promising until the first grainy, filmy, insipid bite.) Yelp, TripAdvisor, and Google can obviously help, if you’re able to sort through the conflicting reviews. This I did with my brother Bryan on a recent road trip that took us through Reno. This post reviews a great taqueria there, and in the process lays out some solid criteria for evaluating one. I also cover (once again) some of the pitfalls of amateur reviews. 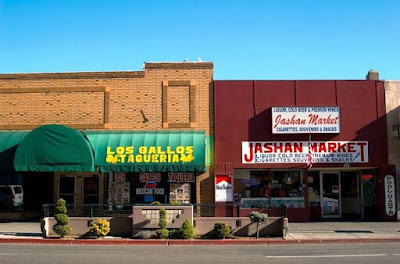 While Bryan drove, I searched top-10 lists for Reno taquerias. My method is simple: see if the same taqueria pops up in the top-10 lists of Yelp, TripAdvisor, and Google. Then I scan the reviews of a favorable place and look for undeniable evidence for or against a place being good. Undeniable would be along the lines of “whole wheat and gluten free tortillas offered!” (against) and “best lengua I’ve ever had!” (for). What I’m looking for is authenticity and assurance that that Sysco is not involved. Just in case you’re not familiar with lengua, it’s beef tongue. I only had it once, from a mediocre food truck. My burrito had giant rubbery hunks of it and it made me feel kind of ill. I hauled the tongue out of the burrito and put it in my cat’s dish, so I could set up a family member to ask me, “Whatsa matter … cat got your tongue?” (Nobody did.) Interesting aside: the resemblance of “lengua” to the word “language” is no coincidence, and the Russian word for language, язык, is the same as their word for tongue. Anyway, I will probably never order lengua again, but I like to know it’s on the menu. It’s like a shibboleth. 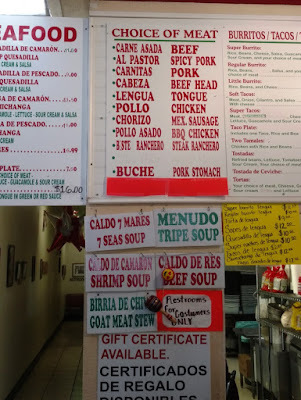 I’ve never wanted to try tripe, but it’s an excellent sign that Los Gallos serves it. And buche? What the hell is that? Google translated it as “maw,” which isn’t really helpful. No animal’s throat would yield much meat, would it? But there’s a Spanish definition given as well: “Abultamiento del esófago de las aves, en forma de bolsa membranosa, donde almacenan los alimentos para reblandecerlos antes de triturarlos en la molleja.” Google translates this as “Bulging of the esophagus of the birds, in the form of a membranous bag, where they store the food to soften them before crushing them in the gizzard.” This puts Los Gallos up there with those really trendy “whole animal” restaurants that cost a fortune. Another good sign! Of course, it’s important to look at the 1-star reviews as well, to make sure there are no ugly surprises, such as “They don’t have burritos, only ‘wraps,’” or “They charged me $2 extra for guac and it was only the faintest smear,” or “I watched the cook shoot the dishwasher in the stomach just to watch him die” (this was Reno, after all). But the 1-star reviews I saw weren’t very damning. One said, “Place in kinda run down but was clean. I just found the food to be meh mediocre and do to its dreary decor I don't want to even bother giving it another try.” That first bit, “Place in kinda run down,” is problematic. If “in” was supposed to be “is,” then there’s a verb tense problem with “was” later in the same sentence. If it’s just an extra tacked-on word, well, then the person is sloppy. The fact of “due” being spelled “do” confirms the borderline illiteracy of the reviewer, and any focus on décor shows poor judgment if not poor character. This person does not deserve to be taken seriously. 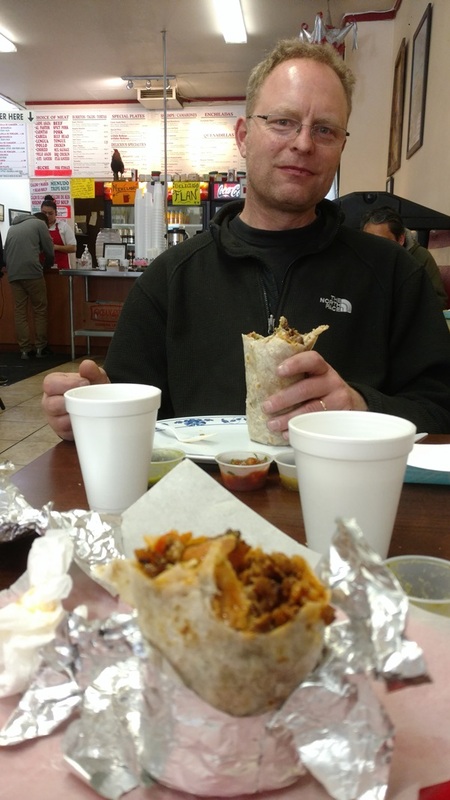 My favorite 1-star review read, “Love the food been coming here for years ... NOW I GET HOME AND THE BURRIOT HAS PICO WHICH I CLEARLY DIDNT ASK FOR!!! ASTONISHED, if this isn't taken care of I will never return, my family won't return and my friends will hear of this.” OMG. Is this person for real? First of all, who doesn’t like pico de gallo? And if this person has loved the food for years, couldn’t a little goof like this be forgiven? “Astonished” … really? Of course we should take the favorable reviews with a grain of salt as well. A 4-star review reported, “This place has been on my list for a while. It’s a bit embarrassing because I live around the corner from the place. Why I haven’t I gone? The obvious is I’m lazy.” Ah, a classic self-referential blathering review. What do I care of the reviewer’s traits and circumstance? And who is that lazy? Should I trust a lazy person? A 5-star review raved, “Tacos were filling, meat was savory, and the bottled coke was delicious.” Look, all tacos are filling, if you eat enough of them, and to call any Coke “delicious” shows an exceedingly sunny disposition that must be marvelous in a human being, but not very useful in a critic. Not only was the lengua confirmed, but they have cabeza (beef brains) and buche (which term they helpfully translate for us). 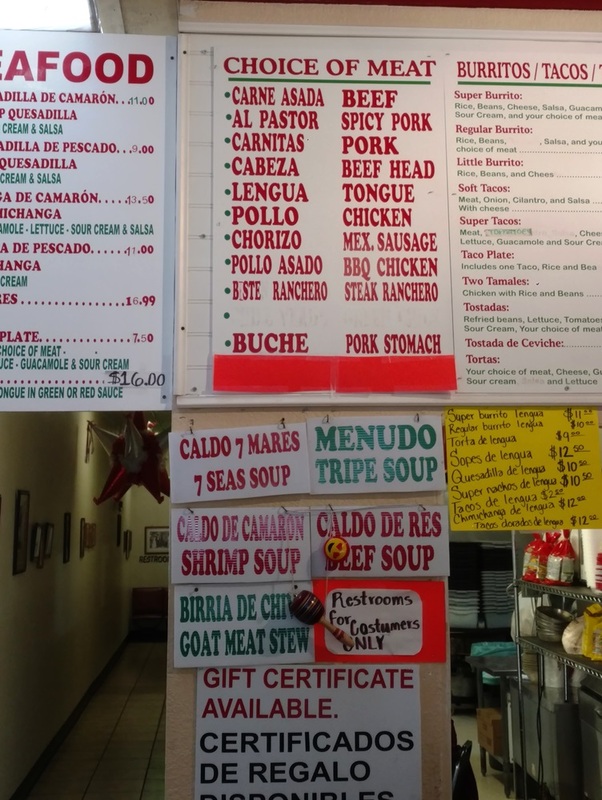 They also serve menudo, which you will never, ever find at Chipotle or Trump Tower, and birria, which is goat. (I thought about asking if they’d put birria in my burrito—which I happened to know would be great—but remembered that I’d been warned that “the girls that work there at the front they both were rude.” I wonder what the items were that have been whited out and papered over on the menu. The super burrito is a bit pricey ($9) but at least the guacamole comes stock. The cashier asked us if we wanted the cheese that the burritos came with. I take this as another sign of authenticity, as I’m dimly aware that traditional Mexican food isn’t brimming with cheese. (Being a gringo, I actually do want the cheese, but it’s nice to be asked.) The food took a while, which is also good. I once went to Chipotle (it was the only place open on a holiday), and although the place was as deserted as it deserves to be, the cook put my burrito together so hastily and half-assedly I almost lunged across the counter to strangle him. Interestingly, Los Gallos accepts Android Pay. The only reason I care is that I got my housecat from the animal shelter, where they implant every animal with a radio frequency identification (RFID) chip. That means if you update your pet’s profile online, adding your credit card number, you can use the animal as a mobile wallet. Not at Los Gallos, though … they don’t allow pets. While waiting for our burritos we helped ourselves to thick, crunchy chips that were just the right amount of greasy. There was a salsa bar with at least five kinds of salsa, plus the little radishes and pickled jalapenos that I never eat. The salsa was really good and really fiery. It made my mouth hurt. I’m sure there’s a 1-star review out there complaining about this, but it’s how Mexican food is supposed to be (at least as far as I know). Okay, let’s cut to the chase: how were the burritos? Delicious. I’ll walk you through mine. First, the tortilla was perfectly grilled. (I like grilled way better than steamed.) The first bite obviously had more tortilla than subsequent bites would, as I bit through the “cap,” but I didn’t have to deal with a bunch of wadded-up tortilla like what you get when there’s too much tortilla for the filling. I hate that, even as a lover of large expanses of starch. There’s only so much you can say about a burrito without starting to blather like a wine “expert” so I’ll stop now. But I have two things to say about the service. One, when I went back to the counter to ask the cashier to thank the cook for me, she was perfectly friendly. 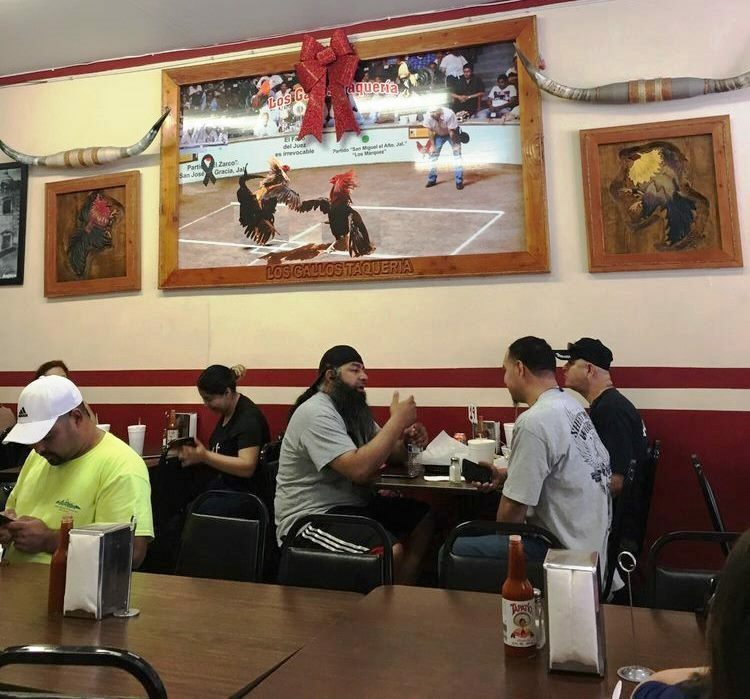 Two, even if the cashier had been totally rude, had insulted me and even my mother to my face, I wouldn’t hesitate to eat at Los Gallos again. I almost wish I had some reason to go back to Reno.